Site functionality and performance. These cookies are required for NGINX site functionality and are therefore always enabled. They contain no identifiable information. 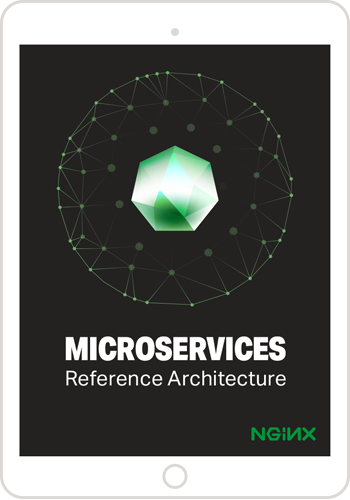 Chris Stetson of NGINX, Inc.
Editor – This blog post is also included in our free book, Microservices Reference Architecture, along with six other blogs about the NGINX MRA. Here at NGINX we’ve begun exploring the frontiers of microservices application development through our NGINX Microservices Reference Architecture, with a sample photo storage and sharing site as our prototype. This blog post is the first in a series of articles dedicated to exploring the real‑world problems and solutions that developers, architects, and operations engineers deal with on a daily basis in building their web‑scale applications. This article addresses an application‑delivery component that has been largely ignored in the microservices arena: the web frontend. While many articles and books have been written about service design, there is a paucity of information about how to integrate a rich, user‑experience‑based web component that overlays onto microservice components. This article attempts to provide a solution to the thorny problem of web development in a microservices application. Our approach to building a web frontend combines the best of web application design with microservices philosophy, to provide a rich user experience that is service‑based, stateless, and connected. 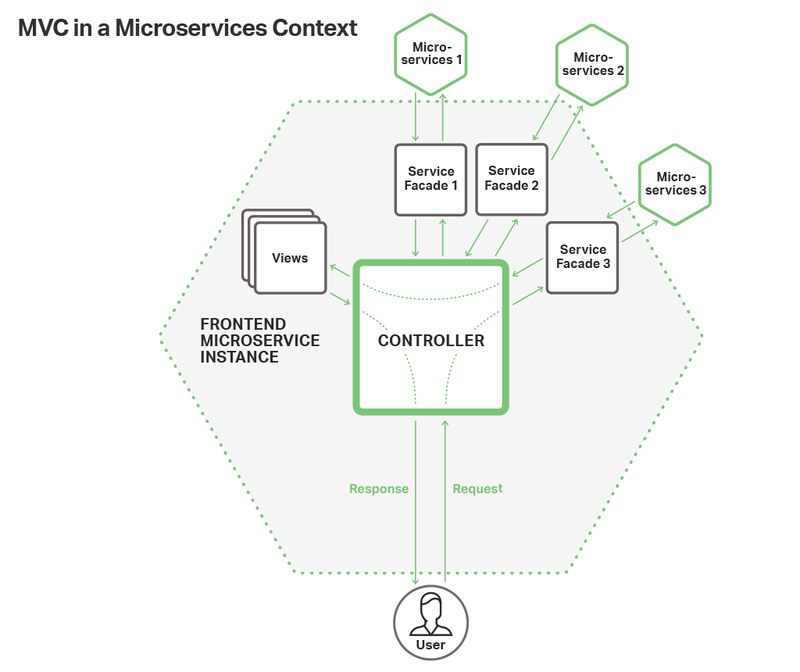 When building a microservices web component, the solution combines a Model-View-Controller (MVC) framework for control, attached resources to maintain session state, and routing by NGINX Plus to provide access to services. The clear division of labor in MVC helps guide the process of converting web applications into microservice‑like frontend components. Fortunately, the biggest area of change is confined to the controller layer. Views don’t need to change in any significant way – the stateless, ephemeral nature of a microservice doesn’t change the basic way data is displayed. Similarly, models in an MVC system map easily to the data structures of microservices, and the default approach to interacting with models is through the microservices that manage them. In many respects, this mode of interaction makes model development easier because the data structures and manipulation methods are the domain of the microservices teams that implement them, rather than the web frontend team. It is in controllers where the biggest changes are required. Controllers typically manage the interplay between a user’s actions, the data models, and the views. If a user clicks on a link or submits a form, the controller intercepts the request, marshalls the relevant components, initiates the methods within the models to change the data, collects the data, and passes it to the views. In many respects, controllers implement a finite state machine (FSM) and manage the state transition tables that describe the interaction of action and logical state. Where there are complex interactions across multiple services, it is fairly common to build out manager services that the controllers interact with – this makes testing more discreet and direct. In the NGINX Microservices Reference Architecture, we used the PHP framework Symfony for our MVC system. Symfony has many powerful features for implementing MVC and adheres to the clear separation of concerns that we were looking for in an MVC system. We implemented our models using services that connected directly with the backend microservices and our views as TWIG templates. The controllers handle the interfaces between the user actions, the services (through the use of façades), and the views. If we had tried to implement the application without an MVC framework for the web frontend, the code and interplay with the microservices would have been much messier and without clear areas to overlay the web frontend onto the microservices. Web applications can become truly complex when they provide an cohesive interface to a series of actions that cross service boundaries. Consider a common ecommerce shopping cart implementation. The user begins by selecting a product or products to buy as he or she navigates across the site. When finished shopping and ready to check out, the user clicks on the cart icon to initiate the purchase flow. The app presents a list of the items marked for purchase, along with relevant data like quantity ordered. The user then proceeds through the purchase flow, putting in shipping information, billing information, reviewing the order, and finally authorizing the purchase. Each form is typically validated and the information can be utilized by the next screen (quantity to review, shipping info to billing, etc). The user typically can move back and forth between the screens to make changes until the order is finally submitted. In monolithic applications like Oracle ATG Web Commerce, form data is maintained throughout a session for easy access by the application objects. To maintain this association, users are pegged to an application instance via a session cookie. ATG even has a complex scheme for maintaining sessions in a clustered environment to provide resiliency in case of a system fault. The microservices approach eschews the idea of session state and in‑memory session data across page requests, so how does a microservices web app deal with the shopping cart situation described above? This is the inherent conundrum of a web app in a microservices environment. In this scenario, the web app is probably crossing service boundaries – the shipping form might connect to a shipping service, the billing form to a billing service, and so on. If the web app is supposed to be ephemeral and stateless, how is it supposed to keep track of the submitted data and state of the process? There are a number of approaches to solving this problem, but the format we like the best is to use a caching‑oriented attached resource to maintain session state (see 12factor.net for further details on attached resources). Using an attached resource like Redis to maintain session state means that the same logical flows and approaches used in monolithic apps can be applied to a microservices web app, but data is stored in a high‑speed, atomically transactional caching system like Redis or Memcached instead of in memory on the web frontend instance. With a caching system in place, users can be routed to any web frontend instance and the data is readily available to the instance, much as it was using an in‑memory session system. This also has the added benefit of providing session persistence in case the user chooses to leave the site before purchasing – the data in the cache can be accessed for an extended period of time (typically days, weeks, or months) whereas in‑memory session data is typically cleared after about 20 minutes. While there is a slight performance hit from using a caching system instead of in‑memory objects, the inherent scalability of the microservices approach means that the application can be scaled much more easily in response to load and the performance bottleneck typically associated with a monolithic application becomes a nonissue. 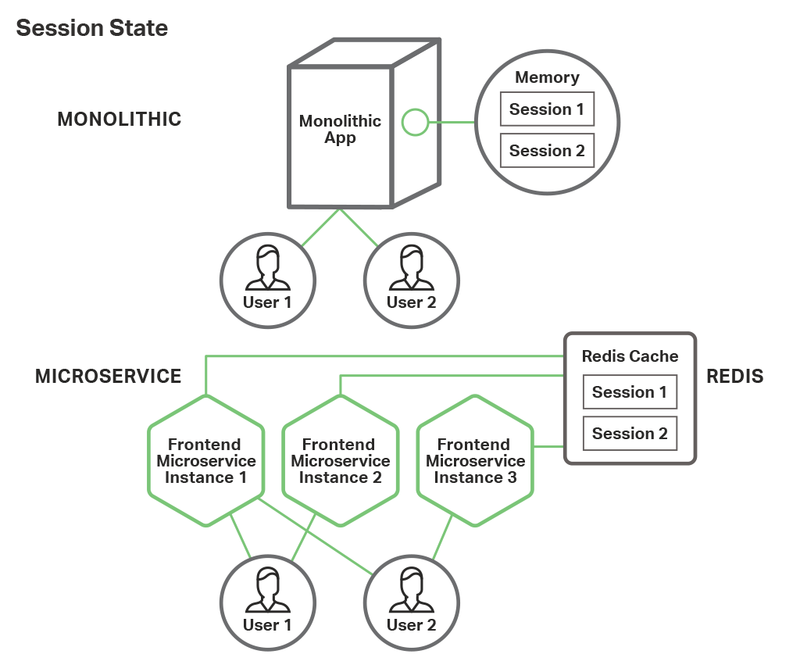 The NGINX Microservices Reference Architecture implements a Redis cache, allowing session state to be saved across requests where needed. Implement the web app using an MVC framework to clearly separate logical control from the data models and display views. Use a high‑speed caching attached resource to maintain session state. This approach maintains microservices best practices while providing the rich web features needed for a world‑class web frontend. Web frontends created using this methodology enjoy the scalability and development benefits of a microservices approach. 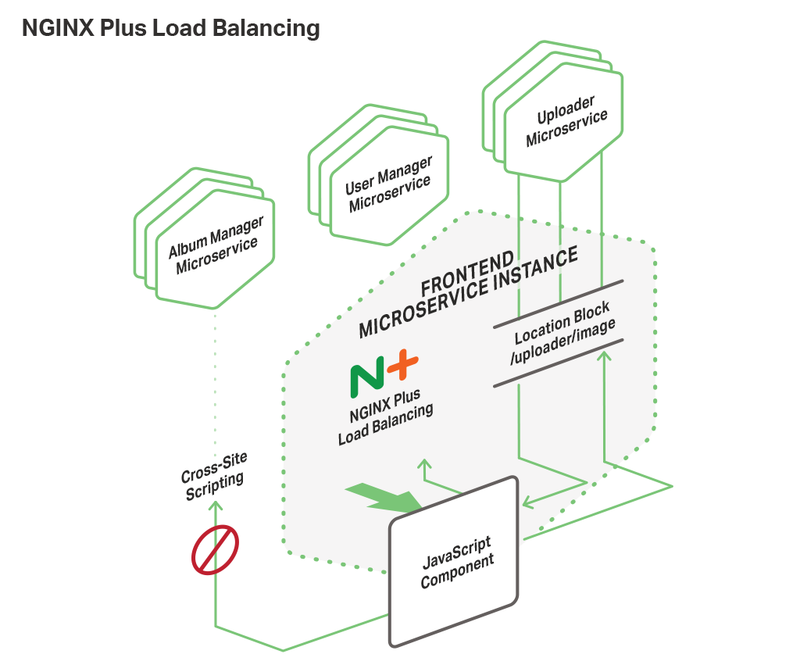 Be sure to watch our webinar for more insights into how to build a web frontend using microservices and NGINX Plus. For in‑depth information about many aspects of microservices, check out our blog series from industry thought leader Chris Richardson. NGINX, Inc. is the company behind NGINX, the popular open source project trusted by more than 400 million sites. We offer a suite of technologies for developing and delivering modern applications. The NGINX Application Platform enables enterprises undergoing digital transformation to modernize legacy, monolithic applications as well as deliver new, microservices‑based applications.